Home BUSINESS Safaricom Thika Data Center joins elite data centers in the world after attaining Tier 3 Design Certification. Safaricom Thika Data Center joins elite data centers in the world after attaining Tier 3 Design Certification. Safaricom, Senior Manager, Data Center Design, planning and operations, Festus Muga (left) explains about the Safaricom –Thika Data Centre and its critical components to Director ICT, Kiambu County, Samuel Njuguna (right), and Safaricom, Director, Risk Management, Nicholas Mulila during the award ceremony of the Safaricom Tier III Data Centre Certification in Thika. 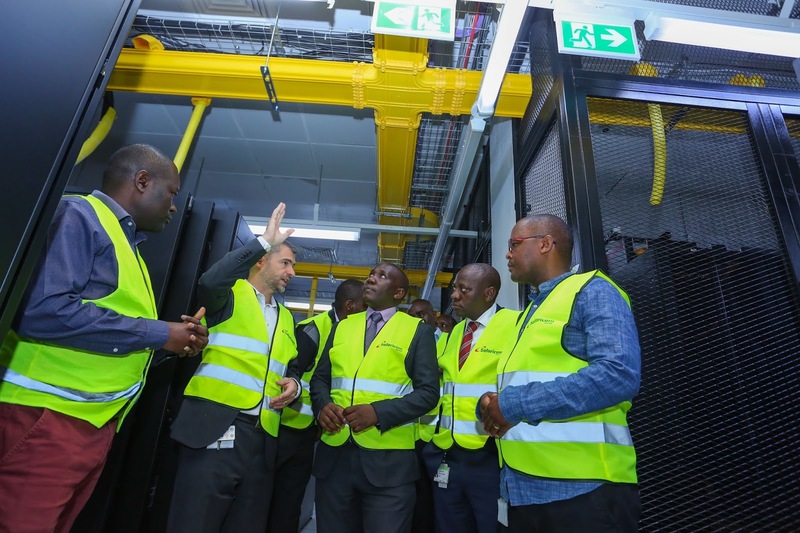 Safaricom has received Tier III Design Certification from Uptime Institute for the Thika Data Center, thus joining elite data centers in the world to be certified by the leading Data Center Authority. The certification was achieved after a thorough forensic assessment of all aspects of Safaricom Data Center design by Uptime Institute experts’ team. "We are honored to have the Thika Data Center certified for international best practices in data center design and operations. The certification provides our enterprise customers with a differentiated service for which independent due diligence has been verified by a global expert,” said Nicholas Mulila, Director Risk Management, Safaricom. Due to its sensitivity and volume, data storage by businesses is crucial. IT infrastructure must be able to cope with growth and provide consistent levels of high-level performance. The certification is important to Safaricom because the Thika Center is the main data center for Colocation services. Through these services, the Telco rents physical office space, network or Internet bandwidth and other resources to the banking sector, Telecoms, Financial Services and its own Internal Services. “We want to provide our customers with the best connection, in the best facilities, no matter where they are. We are glad to have an independent verifier declare that our facilities are up to scratch and are available 24/7 and meet the most demanding requirements of 100% uptime,” said Mr. Mulila. The Tier III Concurrently Maintainable Design Certification means that the data center will not have to be shut down for equipment replacement and maintenance. Data centers are critical in the efficiency of data center organization, installation and maintenance of network equipment. They play a crucial part in Safaricom’s ambitious network expansion plan to boost service delivery. Safaricom has 11 key data hubs in Kenya. With over 4,600 network sites across the country, 86% of the Kenyan population are covered with 3G network and 35% have access to 4G. Safaricom continues to improve mobile penetration, which currently stands at 88.7%. Uptime Institute is the global authority focused on improving the performance, efficiency, and reliability of business critical infrastructure through innovation, collaboration and independent certifications. It is best known for its Tier Certification framework and its high standards.